Alright y'all. We are officially in the middle of the Pacific. Not only have we not seen land for the last 2 weeks, but we still haven't even seen another boat. Every once in a while somebody claims to see a sail over the horizon, only to determine that is must have been just a mirage. We're so glad to have our satellite email connection to the outside world - it would be rather lonely without it. What a journey it's been! We're just about half way to the Marquesas, and already we feel we've had more than enough adventure for the whole trip. In our last blog post, you heard us complaining a bit about all of the repairs Arctic Loon is demanding from us daily.... that hasn't changed. As we often say, "there's always something...." Since then, our auto pilot has gone out, (leaving us hand steering or using the hydrovane on all our watches). 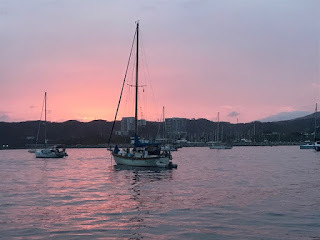 But we managed to get the whisker pole safely down, secured, and back up the mast again, and by entirely taking apart Anne and Connie's cabins, we fixed a minor fuel leak that had Connie's bedroom smelling horrible. The day after that incident, Diana declared "today if something breaks, we're NOT fixing it!" We had a lovely restful down day. We're in good spirits about it all though, and proud to have the knowledge to fix everything! Though lately, more of our energy has been taken by trying to avoid storms. We've hit a stretch of about 200 miles that's just littered with squalls. Last night, or weather forecast showed a very good chance of us running into one, so we spent the whole night watching the radar and adjusting accordingly. We were so proud in the morning when we'd all had a decent amount of sleep. Today, after we thought we had escaped them all, we nearly got hit by a big one that came at us at about a mile a minute. 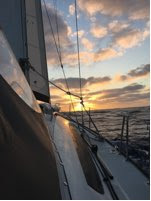 We ended up doing an about face, heading back toward Mexico and going around in circles until we found a safe passage between the 2 storms on either side. It felt much like a video game staring at the radar trying to avoid all the bright colors. If we had been hit by these, it wouldn't have been the end of the world, but we would have had nasty winds at upwards of 30 knots and lots of rain. We got the rain anyway, and actually enjoyed it. Free showers! Currently, we're heading due south to avoid the ITCZ (big zone of doldrums with no wind), and we plan to gybe in about 4 days to head west, putting us straight on course for the Marquesas. 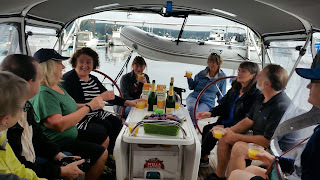 Just before we turn, we should hit the equator, where we'll have our big celebration, and break our dry boat rule for some champagne! Being at about the half way mark, our spirits are high, and we're starting to dream more and more of our reward that's just 1500 miles away! Below, I'll mention a few things I might have forgotten about the way things work on Arctic Loon. We're finally getting into our routine and rhythm! We trade off time at the helm in shifts of 2 hours. We originally had it set to 3, but found it's easy to start getting a little loopy in that third hour. This includes night time of course, so you'll always find someone sleeping around here! If it's rough, someone (usually Captain Diana) is always sleeping in the cockpit in case the person at the helm needs them to change the sails. We also have whistles and a horn to wake everyone up if need be. Sadly we're finally starting to run out of fresh veggies. We've been getting very creative, making "salads" out of cabbage, pickled cucumbers, hiccama, raw beets, etc. We're also growing our own sprouts on board, which has been a life saver. Typically we all fend for ourselves for breakfast and lunch (yogurt/granola, PB&J sandwiches, snacks, leftovers, etc.) For dinner, someone makes a communal meal that's typically a bowl dish like a stew, pasta, stir fry, Indian medley, etc. It's often difficult to cook, so we try to keep it as simple as possible. For these meals, thankfully we have lots of frozen veggies. We hired a weather router before leaving who is an expert at reading weather reports. He gives us regular advice based on what he sees, and gives us suggested waypoints to head toward. But in the end, it's us who make the final decision. Diana and Anne are always downloading their own weather reports from the Iridium predict wind app, and we've spent much time pouring over them trying to decide where to go. It's not as easy as just pointing the bow toward Hiva Oa!